Mental health is just as important as physical health – especially when you’re travelling! This week, we’re honouring Mental Health Week in Canada and Mental Health Month in the USA. We’ve compiled a list of four things everyone should know about travel and mental health. 1. Travel can be stressful. Travel can be an opportunity to relax and “get away” from the stressors of everyday life, but travelling may also introduce new sources of stress or drudge up old anxieties. Leaving home, difficulties during transit, unexpected expenses, and navigating a new place, culture, or language can all cause stress. Talk to your friends, family, or a health professional about your travel plans. 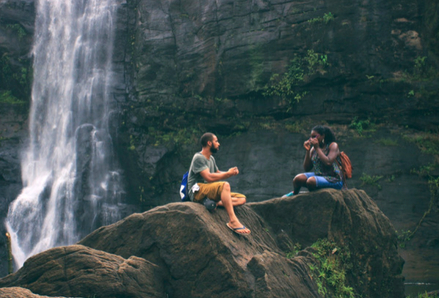 Talking about your trip and the things you’re worried about can help you work through your feelings and be prepared to cope with stress on the go. Check in with yourself and know your limits. Don’t be afraid to take a break from your planned activities if you need to relax and recharge. Keep up routines that make you feel stable and pack a few items to help you relax at the end of a challenging day, such as a journal, music, or your running shoes. For a handy checklist on coping with travel stress, check out our Travel Stress tipsheet. 2. Travel health insurance typically excludes coverage for mental health conditions. Legislation in North America requires that insurance policies provide coverage for physical and mental illnesses. However, travel health insurance is exempt from such laws. As a result, pre-existing mental health conditions and sudden mental health emergencies are rarely covered. You may need to pay a higher premium or deductible or look for more progressive policies outside of North America to get adequate coverage for a mental health condition. In addition to cardiovascular events and injuries, mental health emergencies are a common reason for emergency evacuation among travellers. Think about the types of health emergencies you may encounter and choose a policy that provides appropriate coverage for those events. Take the time to research and compare policies. 3. Your prescription medication may be regulated at your destination. If you are travelling with prescription medication for a mental health condition, it’s important to research your destination country’s drug importation laws to see if your medication is regulated. Many medications for treating mental health conditions are highly regulated and countries impose restrictions on the amount and type of medication that can be imported. Check if your medication is restricted at your destination. Our tipsheet on Travelling with Medications can help. Bring a letter from your healthcare practitioner that describes your health condition, the details of your prescription medication, and its dosage. Contact a doctor or mental healthcare provider at your destination to ensure that your medication is available and that it can be prescribed to you in case you need a refill. 4. Always have a plan. Coping with a health emergency at home can be difficult enough, but it can be much more stressful when you’re travelling. Having a plan will help you cope and find help if you experience a relapse or encounter a triggering event abroad. Talk to your mental healthcare provider to make sure that you are fit to travel. Ask if you can schedule sessions remotely while you are away or contact them if something comes up. Ensure you have the contact information for a doctor or mental healthcare provider at your destination that you can call if you need a prescription refill or require assistance. Have a close friend or relative at home that you regularly check in with and who knows the itinerary of your trip. Do some research on the standards of healthcare and perceptions of mental health at your destination. In some countries, mental health care and treatment may be difficult to find. When you return from your trip, follow up with your mental healthcare provider if you experienced a lot of stress, a relapse, or had a mental health event while you were away. When getting ready for your trip, it’s important to consider your mental wellbeing in the same way that you do with your physical health. Some people, particularly young adults, may experience a mental health event for the first time while travelling. For others with a history of mental illness, pre-existing conditions can worsen or a relapse of a dormant condition can occur. Despite this, travelling with a mental health condition can be a safe and highly rewarding experience when you are aware of your triggers and are properly prepared. Stock photo by Nandhu Kumar, Pexels. Article by Claire Westmacott. Edited by Daphne Hendsbee.